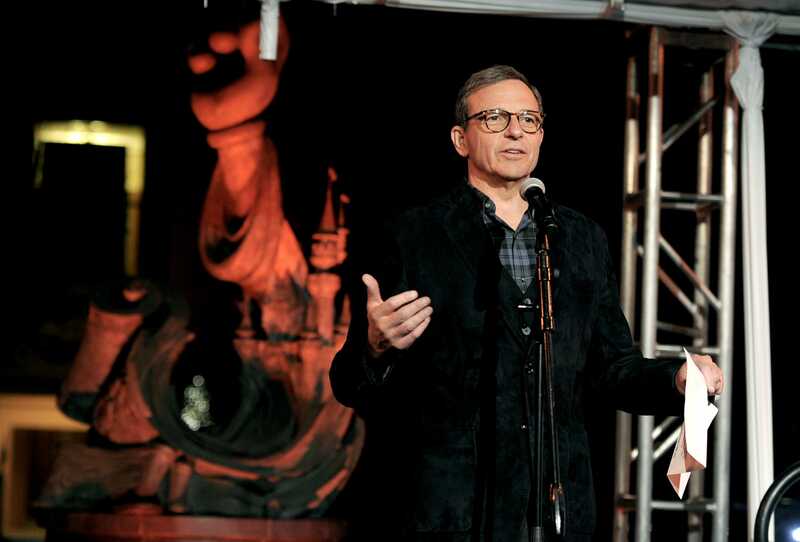 Disney reportedly held discussions with 21st Century Fox about buying a portion of its assets. Jefferies says those assets could be worth $US40 billion. Shares of Disney and Fox are up after the reports of the talks. Disney reportedly held discussions with 21st Century Fox to buy a portion of its assets. According to Jefferies, those assets could be worth $US40 billion. The media and entertainment company is reportedly eyeing Fox’s international cable networks, its Star film studio, and it’s non-sports/non-news cable networks, such as FX and National Geographic. 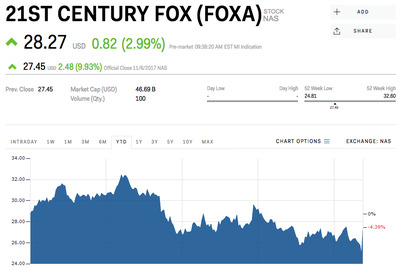 In the event of a deal, John Janedis of Jefferies believes Fox and its properties could be worth 40% above current levels, or $US39 per share. There’s value in the “sum of the parts,” Janedis notes, which could give Fox considerable upside. He estimates that the international cable networks are worth $US14 billion at a multiple of 10x EBITDA, the film studio is worth $US560 million at 9X EBITDA, the non-sports or news cable networks is worth $US1.2 billion in 8.5X EBITDA, and stakes in SKY and other assets could be valued at $US8.6 billion and $US5 billion, in addition to Fox’s 30% stake in Hulu. Fox’s shares have risen 10% since news of the discussions between the media conglomerates were revealed. Disney’s shares have gone up 1.58%. Rupert Murdoch, the media mogul behind Fox, has reportedly rejected Disney’s offer as it currently stands. “Given the potential structure, we do not think the remaining assets are appealing enough to FOXA as a standalone to complete a deal in the proposed form,” Janedis wrote in a note. Disney would have to offer the company at least $US37 billion to make the deal worth it. 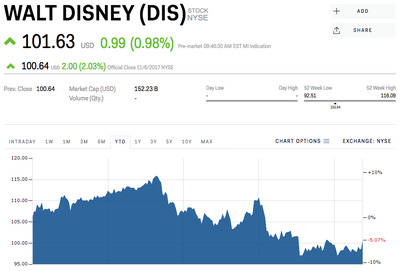 Disney has recently made a series of investments to boost its direct-to-consumer video streaming services. Fox’s shares are trading at $US28.27 though it has been lagging down 4.39% year over year. Disney stock is trading at $US101.63 and is down 5.07% for the year. To read more about the upside of Disney’s streaming services bet, click here.